It’s no secret, you want your face to look it’s best – it’s one of your most prominent features, always exposed to the world. When your face looks good, your confidence is boosted, radiating from within. Unfortunately, pores, fine lines, blemishes, dull or uneven skin tones, acne scars, age spots, sun damage, wrinkles, and other skin imperfections can get in the way. Luckily, microdermabrasion treatments can solve many of these issues above, and if you’d like smoother, clearer, younger-looking skin, it may be the perfect solution for you. Microdermabrasion is one of the most effective cosmetic skin care treatments available today for improving the appearance and texture of the skin. The procedure involves exfoliating the skin with microscopic crystals to remove dead skin cells, clear up clogged pores, evening skin tones and stimulating healthy, vibrant skin renewal. If you’re wondering whether or not this skin care treatment is right for you, check out our Quick Guide to Microdermabrasion and consider the following benefits that it offers. Microdermabrasion is often referred to as the ‘lunchtime facelift, as it can significantly improve your face in a short amount of time. 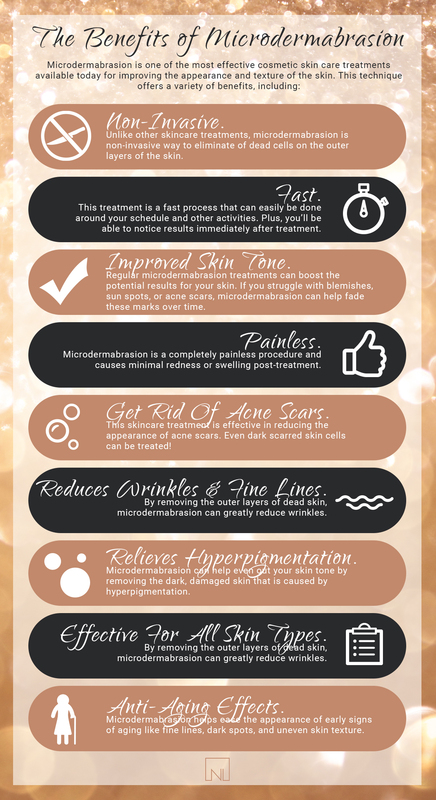 Here are eight benefits of microdermabrasion to help you decide if this unique skin care treatment is right for you. Non-Invasive. Unlike other skincare treatments, microdermabrasion is non-invasive, implying that it does not require skin operations. The process is light, and it is a pain-free way to get rid of dead cells on the outer layers of the skin. You get the results you want – no anesthesia, needles, or other more aggressive measures. Painless. You may have heard the saying, ‘pain is beauty’, but who said beauty has to be painful? Microdermabrasion is a completely painless procedure and causes minimal redness or swelling post-treatment. In most of the cases, your skin will look normal within 24 hours. Fast. Microdermabrasion is a fast process that can easily be done around your other activities. You will notice results immediately once the procedure is complete. Generally, a microdermabrasion treatment can be completed within an hour. Improved skin tone. If you struggle with blemishes, sun spots, or acne scars, microdermabrasion can help fade these marks over time. 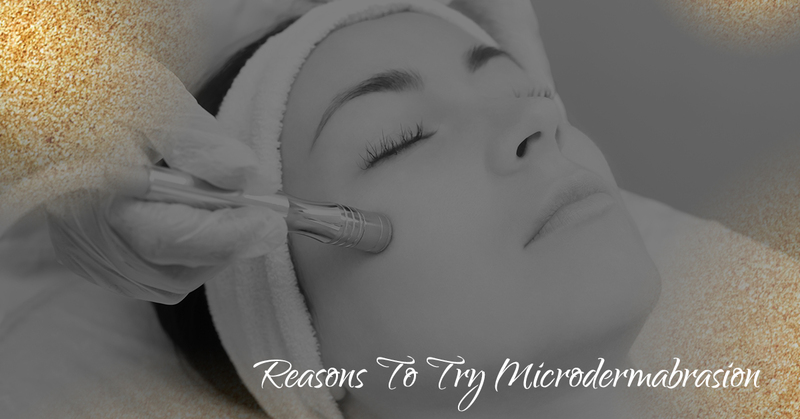 Getting regular microdermabrasion treatments will boost the potential results for your skin. People who have chronically dull skin may even notice a brighter complexion that looks healthier and younger. Gets rid of acne scars. Diamond microdermabrasion is extremely effective in reducing the appearance of acne scars. Even if have dark scarred skin cells from severe acne, microdermabrasion is effective at treating it! Reduces wrinkles and fine lines. Additionally, by eliminating the outer layers of dead skin, microdermabrasion can greatly reduce wrinkles. Once the dead skin is removed, it stimulates your body to produce brand new skin cells. This not only helps repair fine lines, but it also helps prevent them from happening again. Relieves hyperpigmentation. Microdermabrasion removes the dark, damaged skin that is caused by hyperpigmentation. This makes it extremely effective in evening out your skin tone. Effective for all skin types. Microdermabrasion is effective for every skin type – whether dry, oily, flakey, or normal. Irrespective of the type of your skin, this process is effective at easily getting rid of skin imperfections. Anti-Aging effects. Microdermabrasion helps ease the appearance of early signs of aging like fine lines, dark spots, and uneven skin texture. It can also work to reduce the appearance of fine lines by stimulating collagen production and restoring moisture to dry and damaged skin. Lastly, the treatment is known to make your skin appear more plump and smooth – both characteristics of younger-looking skin. Ready For Microdermabrasion in San Jose? Contact Nichole Lynn Esthetics! As you can see from the benefits above, microdermabrasion is an extremely effective procedure. It helps treat just about everything, from wrinkles to acne scars, to hyperpigmentation and uneven skin tones, and so much more. If you are ready to try microdermabrasion in San Jose, contact Nichole Lynn Estheticians. As one of the only licensed esthetician in San Jose, I can help you achieve smoother, brighter, and younger-looking skin with a quick, non-invasive microdermabrasion treatment. To learn more about microdermabrasion services or to schedule an appointment, get in touch today!